Westwards, over the hills from Urbino where we were a fortnight ago, we descend to the upper Tiber valley where Umbria meets Toscana, and we find the little cities where Piero della Francesca came from. While this picture may indeed show the landscape on that wonderfully hairpinned journey between Urbino and Borgo San Sepolcro, its representation of the Cognoscenti team may be a little fanciful. 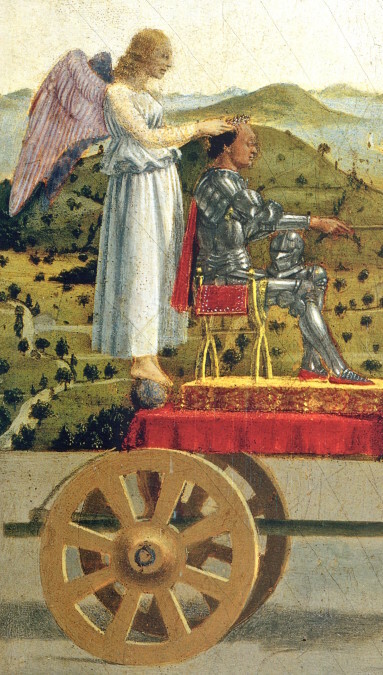 But having just returned from looking at Pieros and smelling the air where they were painted, I can’t wait for the concentrated few days of our Piero della Francesca tour in September 2016.